When your potatoes are ready, line the bottom of a cupcake or whoopie pie pan with the hashbrowns. A whoopie pie pan works perfectly as it's flatter and will fit your ingredients perfectly, but a cupcake pan will work fine too. Just use a small layer of potatoes at the bottom of each cavity and slightly up the edge of your pan. 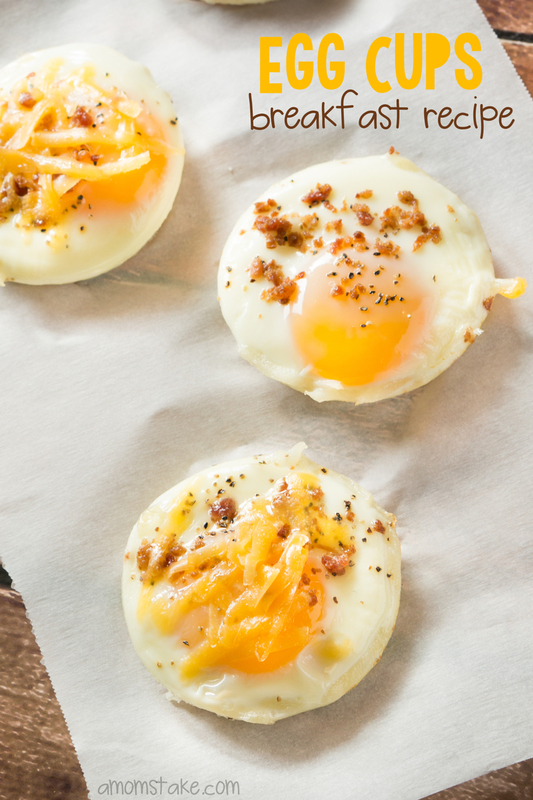 Crack a single whole egg into each of the individual cups on top of your hashbrowns. Sprinkle bacon bits on top and any seasonings you might desire as well. I added just a touch of salt and pepper to ours. Cook your egg cups for 15 minutes, or until the egg white is cooked through, at 375° F. Remove and sprinkle with cheese. The cheese will melt out of the heat, or you can add your grated cheese the last few minutes your eggs are cooking in the oven.